Regia Anglorum is a society founded to accurately re-create the life of the folk of the Viking Age, as it was lived in the one hundred years before AD1066. Naturally, our aim is largely concentrated on the effects that the Viking raids had on the British Isles, but we don't ignore parallels on the near continent. 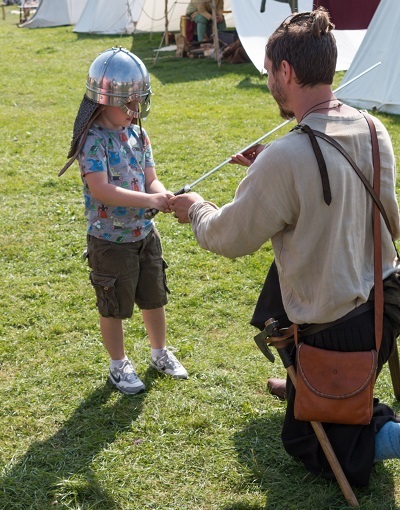 Whilst the Vikings are the attention grabber, our efforts are very much aimed at portraying a balanced image of life as it was lived around a thousand years ago. The audience at York listens to the Bishop bless and inspire the Saxon troops to drive out the Viking invaders. Not that they always carry out his wishes as he would want. Regia Anglorum has been performing the event at York for over twenty years. Although February can be a somewhat unsavoury month for an event like this, the large size of the international crowd always surprises us.